The maglula 22UpLULA is a versatile loading and unloading speed loader for use with a wide range of .22LR double-stack magazines, including converted magazines. You can also use it with 1911 converted mags - maglula offers a 1911 Aligner Insert to help with the fit for that mag. Although this product does not load .380 to .45 mags, one can use the BabyUpLULA or UpLULA loader with these calibers. This combo loader and unloader is an essential addition to your range bag to improve your experience of a day at the range. Does not work with Tactical Solution 1911 SS 10rd .22LR Aluminum mag. 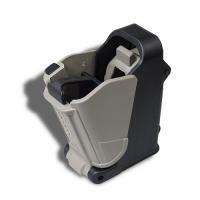 Does not work with Tactical Solution 10rd .22LR Aluminum mag.